Like many Southerners, I use the word “honey” as a term of endearment. 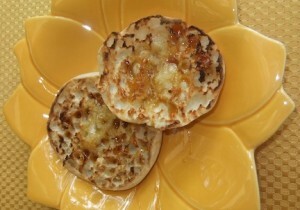 But I love that sweet, golden delight made by bees, especially drizzled on toasted muffins and hot biscuits. Man has always enjoyed the benefits of honey. It’s a sweetener for beverages and often cooked in cakes and breads. In the South, honey is usually a key ingredient in barbeque sauces. Medicinally it is used for treating burns and soothing throats. Many beauty products like soaps, lip balms and lotions feature honey. And local raw honey, which contains pollen, can help build immunities and alleviate the symptoms of some allergies. 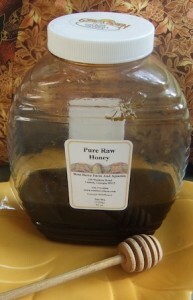 While looking for unusual holiday gifts a couple of years ago, I discovered raw honey from Ross Berry Farm. The honey was big hit and of course I kept a few jars. It’s incredibly flavorful and delicious! To help pollinate the raspberries, they got some bees. That’s when the magic happened. Ross Berry Farm is in an ideal area for harvesting honey. And as it turns out, raw honey keeps indefinitely! “Shortly after we got our first hives I found myself at the local library co-founding The Cherokee Bee Keepers,” adds Ross. Starting with two hives, the farm now has more than 45. “Our hives are scattered throughout the farm and in the north Georgia mountains, so the bees are able to find a lot of nectar sources,” he says. I recommend the Georgia Wildflower Honey from Ross Berry Farm. It’s their most popular flavor. I was surprised to learn about the different kinds of pollen that go into making this honey such as cherry, poplar, kudzu, privet, blackberry, blueberry and wild crab apple! They also offer Tupelo and Gallberry Honey. You can purchase honey at their farm in Canton and at locations around the state, like Scottsdale Farms in Alpharetta, and Botanical Garden of Georgia in Athens. For info or to order online, visit Ross Berry Farm’s Website and click on Queen Bee Gifts.